AXS TV expands its music programming lineup with the all-new original series “Rock & Roll Road Trip With Sammy Hagar”, premiering Sunday, January 24, 2016 at 9 p.m. ET/6 p.m. PT. The six-episode series features all-star guest appearances and unforgettable performances, as the Red Rocker drives across the country to jam with some of music’s biggest names. “Rock & Roll Road Trip With Sammy Hagar” is part of AXS TV‘s fully loaded Sunday night music block, which also includes the fan-favorite concert series “Live From Red Rocks” at 8 p.m. ET/5 p.m. PT, and the all-new music competition series “Breaking Band” at 9:30 p.m. ET/6:30 p.m. PT. 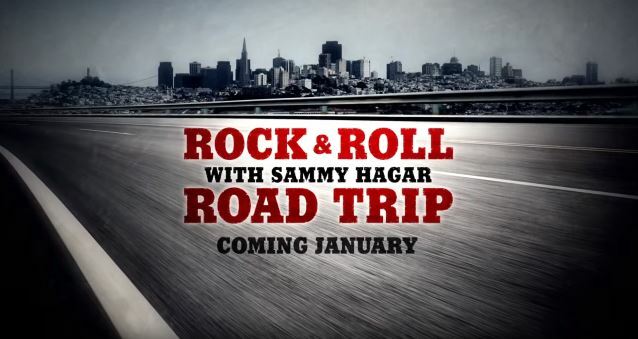 A new trailer for “Rock & Roll Road Trip With Sammy Hagar” is available below. “Rock & Roll Road Trip With Sammy Hagar” delivers the ultimate backstage pass, as Sammy Hagar guides viewers on an intimate and unforgettable journey celebrating all things rock ‘n’ roll. Throughout the season, Hagar travels to the homes of some of rock’s biggest personalities and best-loved artists, interviewing them, jamming with them, and exploring their favorite haunts. The series will also present Hagar‘s own adventures as he rehearses with his new all-star group THE CIRCLE, shares his rules of the road, and rocks on tour and at festivals, including Carolina Rebellion. In the series’ first two episodes, Hagar and former VAN HALEN bassist Michael Anthony cruise the Sunset Strip and reminisce at the world famous Whisky A Go Go, before heading out to MÖTLEY CRÜE star Tommy Lee‘s house to cook, talk, and perform rock staples “Rock Candy” and Jeff Beck‘s “Going Down”. Then, Hagar heads out to San Francisco for a special GRATEFUL DEAD episode, joining founding members Bob Weir and Mickey Hart as they relive the glory days of the Peace & Love Movement on Haight-Ashbury, delve into their musical influences, discuss what made the GRATEFUL DEAD so special, and bring the house down with a Hagar/Weir duet on the GRATEFUL DEAD classic “Loose Lucy”, followed by a jam session with Hagar and Hart. Other season one highlights include a Seattle session with HEART guitarist Nancy Wilson, and appearances by shock rock icon Alice Cooper, ALICE IN CHAINS axeman Jerry Cantrell, and many more. Not only is the series breaking new ground in performance collaborations and first-person commentary, but it also is the first AXS TV original series to be sponsored. Mercury Insurance, one of the nation’s top auto insurance providers, is continuing its support of AXS TV‘s event programming by partnering on this show. Last year, Mercury Insurance was the official broadcast partner of the network’s live music festival coverage.